Seven Stories Press, 9781609803728, 208pp. Rise of the Videogame Zinesters is a call to arms for anyone who's ever dreamed of making their own games. Anna’s guide to game design encourages budding designers to bring their unique backgrounds and experiences to their creations and widen the playing field of an industry that has for too long catered to an adolescent male consumer base. Anna’s newest game, Dys4ia, an autobiographical game about her experiences with hormone replacement therapy, has been featured in The Penny Arcade, IndieGames, and TigSource. "Free of the constraints the giant studios labour under, one- and two-person teams are using an artisinal approach to make deeply personal and innovative videogames. Rise is a great guidebook to understanding—and more importantly, participating in—this dynamically evolving culture." voices of all kinds if it is to evolve." "You would expect outspoken game designer and polemicist Anna Anthropy's first book to be controversial. You might not expect it to be so heartfelt—even inspirational. Equal parts autobiography, ethnography, and how-to manual, this book concisely makes the case for the unique power of "zinester" games—independent video games made primarily by one person. For newcomers to video games, it's a great introduction; for established video game designers, it's a wake-up call. 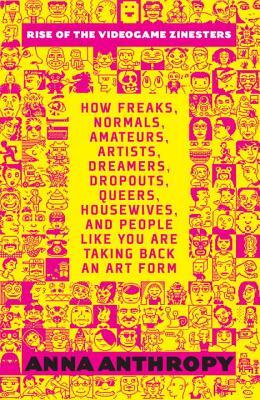 If you're teaching a course about video game culture or video game design, this book deserves a spot on your syllabus."